The secret to this recipe – the simple batter coating that turns to a delicious golden crisp and protects the tender eggplant from becoming greasy. The result is melt-in-your mouth amazing. Probably not something often said about the unassuming eggplant but absolutely true. I like to use your basic deep purple, short, squat eggplant as opposed to thinner, longer shaped varieties. They make nice big slices and don’t worry about their being a bit tougher. The salt, along with puling out any bitterness, will also help to make the meat more tender. 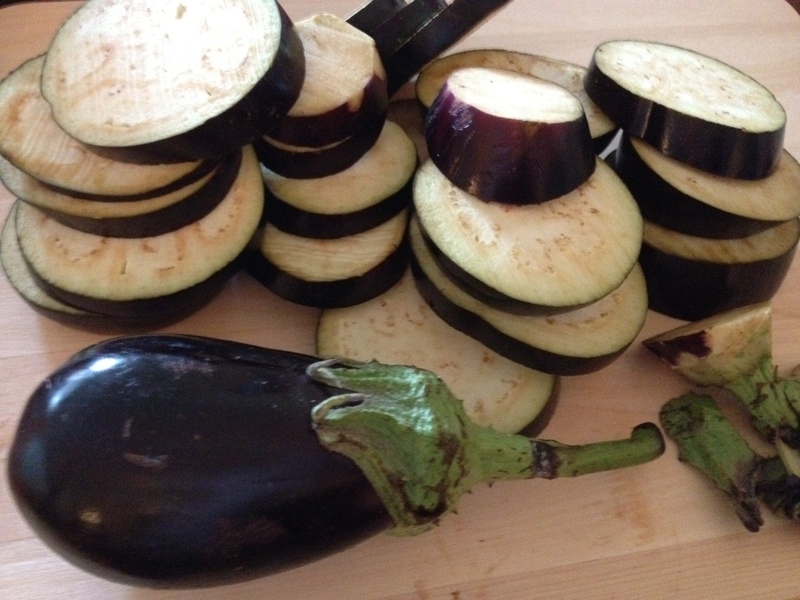 When slicing your eggplant, try to keep a uniform thickness as it makes for more even cooking. Lay out slices in a single layer and sprinkle lightly with salt. Allow them to sit and ‘sweat’ for at least a 1/2 hour while you prepare the batter and get set up to fry. And remember to rinse off the eggplant well before cooking. Please don’t be tempted to skip the ‘sweating’ step. It makes a huge difference in your final product. 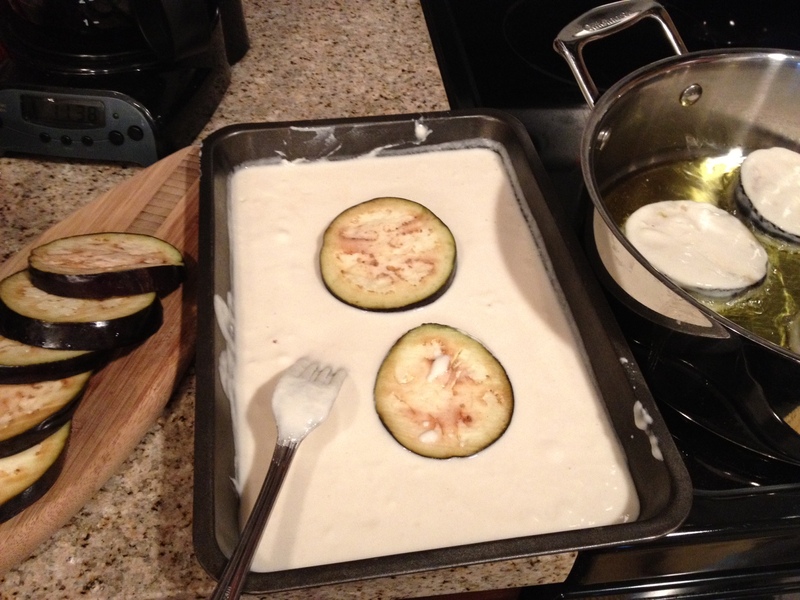 Choose a pan with a good size diameter as you want your eggplant slices to have room between them when cooking. A crowded pan makes for soggy slices! Having a pan with higher sides is helpful also as is cuts down on oil sputters and spatters. Once you’ve mixed the batter in a mixing bowl, transfer it to a low sided pan. This will give you plenty of room for dipping and flipping your eggplant to get a good coating. And a regular dinner fork is the best tool here. 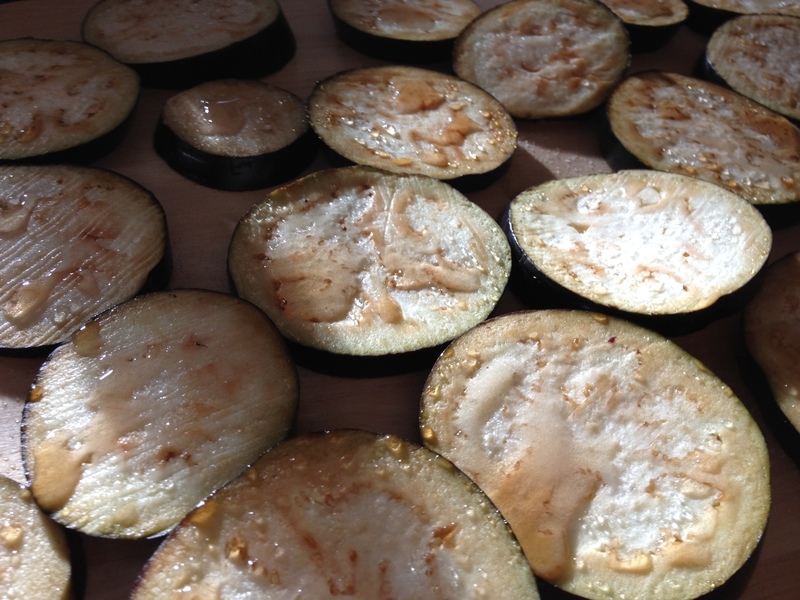 The better coated your eggplant slices are, the higher they’ll puff up and the more tender the eggplant flesh will be so really get them in there. And I want to stress – it’s really important to use bubbly/sparkling water in the batter. It gives a lightness to the fried eggplant that you just won’t get with flat water. I like seltzer but in Greece many times cooks use soda water instead. If you want to use soda water, just halve the amount of salt. Heat olive oil in pan on low heat. I have an induction stove top and cook this recipe on 3. Dip eggplant slices in batter, coat both sides well, place carefully into hot oil. Cook 3-4 minutes on each side to a light golden color. Place cooked eggplant onto a paper towel lined plate to drain off any excess oil. Continue cooking in batches of 4-5 slices until done. I suggest moving the pan off the heat in between batches so that your oil won’t get too hot or start smoking. 1/2 cup oil should keep you for 2 medium eggplants but it doesn’t hurt to have an extra tablespoon or two to add if you need it. And remove any left behind little bits of batter from the oil in between batches so they don’t burn. Serve warm or room temperature. If reheating, don’t microwave as they’ll be soggy. 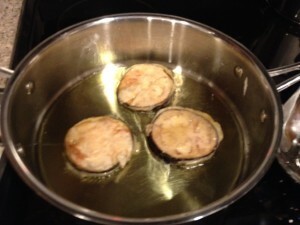 Instead, wrap eggplant slices in foil paper and heat in a 350 degree oven for 15 minutes. Enjoy! 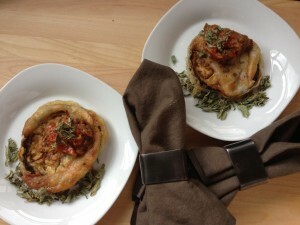 Thank you soo much for posting this recipe!!! 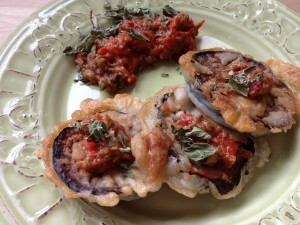 I have been looking for a fried eggplant recipe forever. It came out perfectly; I really liked the addition of club soda/sparkling water. I made this tonight, it was delicious!!! I regret not following the “remove the pot from heat between batches” and kind of ruining the second half of eggplant pieces, but I’m new to frying and you have put me at ease. My boyfriend said this could be one of the best meals he’s ever had! His mother’s grandfather was Greek, so this has been very fun reading your great recipes and thinking of the stories I hear about him. 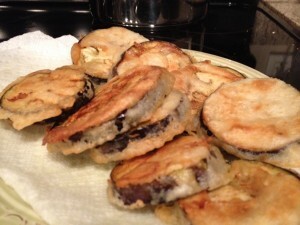 I made the mushroom pitas last night and served them for lunch and with the eggplant tonight. They’re incredible! Looking forward to making the fig jam soon… Yum! Thanks to you and your family, many blessings. I also roasted garlic for the first time today to make a tomato sauce… Heaven! Thanks for the simple instructions. We made this foe dinner last night and could not believe how delicious it was! We added a bit of seasoning to the batter, but otherwise followed the recipe exactly. The eggplant was cooked perfectly and the batter turned a lovely crispy golden brown….We kept the leftovers between paper towels in the fridge and heated them in the convection oven this morning and they were still fantastic. (I had mine with maple syrup, like pancakes and they were amazing) What a wonderful recipe. Thank you.